Ouachita in the News! 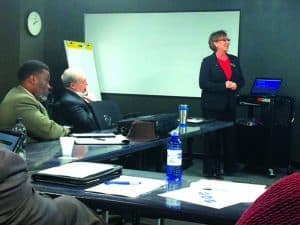 Group meets about River potential – Inland Rivers, Ports & Terminals, INC.
Deidre Smith, Director of the Arkansas Waterways Commission led a strategic planning meeting concerning the Ouachita River at the offices of the Ouachita Partnership for Economic Development. In attendance were several members of the Camden Port Authority, board members of the Ouachita River Valley Association, members of the Arkansas Economic Development Commission and Camden Mayor Julian Lott. Presentations were heard from Skip Martin of the Vicksburg District United States Army Corps of Engineers on the the Ouachita River History and the locks and dams. A 337-mile-long “Ouachita-Black Rivers Navigation Project” began in 1902, to create a navigable waterway from Camden, Arkansas to Jonesville, Louisiana, and when completed in 1924 included six locks and dams that were 84 feet wide and 600 feet in length. Martin said the two lock locations in Arkansas, Felsenthal and Thatcher were both constructed in 1984. Bryan Scoggins of the Arkansas Economic Development Commission gave a short presentation on the Opportunity Zone regulations set up by the federal government. Two of the zones are in Camden and offer a deferment on capital gains tax in regards to investing in businesses. Scoggins did admit that a lot of the details on the zones still have to be worked out by the IRS. Smith indicated an interest in what materials could be transported on the river and said that the Union Pacific railroad located in town could be a huge asset paired with the river. Though barge traffic has slowed considerably from the heyday of the river. The idea was tossed around in the meeting that river traffic could connect with the SouthArk Intermodal Park to support transportation.